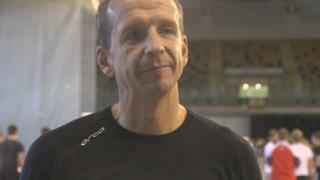 We asked physical activity expert Greg Whyte to share some tips on how to stay focussed and maintain your new year's resolution throughout the year. From setting goals, to finding rewards and ways to motivate yourself, Greg talks us through the process of making a resolution that will stick. The Olympian, and now experienced sport scientist, knows a thing or two about personal challenges having trained many celebrities, including Davina McCall, to run, swim and cycle long distances as well as having previously competed in modern pentathlon. We caught up with Greg the Emirates Arena in Glasgow for day two of the BBC Get Inspired Active Academy. For details on how to get started in a sport or activity have a look at our Activity Guides.